Begin with a good foundation and you're already well on your way to an elegant treat for you and yours. 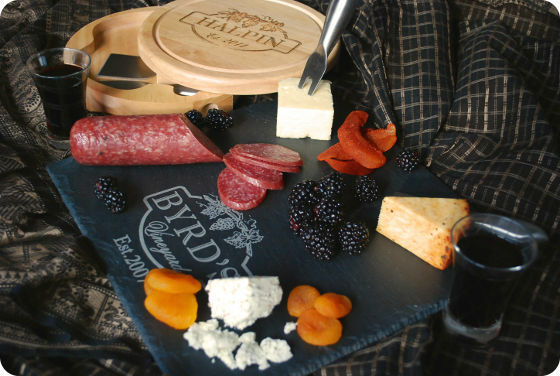 I like to make sure I have a nice board or plate to present the cheese and accompanying items on. 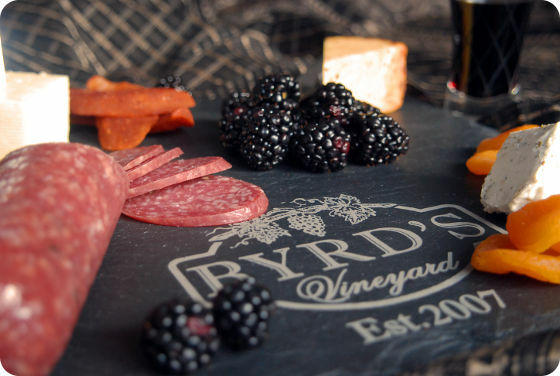 This can be as simple as a polished wooden cutting board or as fancy as the custom-marked slate serving board pictured here (available from Personal Creations). Also, make sure you have adequate serving utensils. 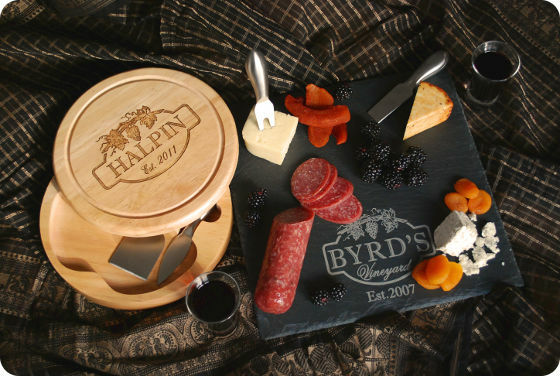 These can range from table and cheese knives to a custom set of cheese-serving utensils. What you don't want is to sit down to enjoy your board and have to get up again and again to find something to slice and serve your cheese with or, worse yet, be left with beautiful cheese and nothing on hand for slicing. There are a few things that are necessary when putting together an appealing cheese course. First, depending on whether it is acting as an appetizer course, light meal, or dessert course, you'll want to vary the variety and amount of items offered in it. If it's an appetizer course, as the board pictured here is, choose 2-3 cheeses (I chose an herbed chèvre, a tomato-basil cheddar with a rosemary-basil crust, and a creamy havarti). Add some fresh and dried fruit and some cured meats (I chose fresh blackberries, chili-crusted dried mango, dried apricots, and wine-infused salami), but keep the variety limited, as you'll be having a main course later. If, on the other hand, you're thinking about making your board the main event, consider 4-5 different cheeses and include at least 2 meat and/or protein offerings (specialty nuts would be a vegetarian protein offering, for example). In addition to fresh and dried fruit (I think they pair nicely with cheese and are always great in any cheese course), think of additional treats to include such as olives, small pickles, bread or crackers, and both sweet and savory dips or spreads. For me, a good cheese board as just described is an amazing way to picnic and I've been known to keep the foundational elements described earlier in my vehicle to allow for impromptu picnicking when the mood strikes! If you are thinking a cheese course for dessert sounds nice, you're not alone. Cheese boards as the end to a meal are very popular and it's not hard to see why. Assemble yours as if it were an appetizer course, but replace cured meats with small chocolates or candies and consider serving some of the fresh and dried fruit either pre-dipped in chocolate or with a small bowl of your favorite dessert sauce. In each case described above, choose cheeses to suit your theme. Appetizer and main courses do well with a wider variety of taste combinations, while dessert courses tend to do a bit better with a variety of textures that bring similar flavors to the board. You can choose a theme, like goat cheeses, or pick out one maker to highlight. Or, better yet, grab your sweetie and embark on an adventure to discover and procure your cheeses together and have the cheese board be the surprise at the end of the adventure! One thing that pairs well with any of the course options described above is wine. Here, toss out any rules you've been given and pick what you both enjoy. Red, white, or otherwise … nibbling on amazing morsels of food and sipping your favorite wine is bound to lead to smiles and even more gratitude. And when putting together a cheese tasting menu is this easy, you'll be finding all kinds of excuses to do so again and again!